So, I have this one awesome friend who is seriously lactose intolerant. And I don’t mean slightly intolerant, she is – will go into full blown attack and be house bound for a day or two, type of lactose intolerant. I am going to call her Sophie for this story. Sophie is also not a huge sweets person, she much prefers savory snacks over sweet treats. So me being me, a person who loves to bake for friends and family as a form of gratitude and/or any special occasion took this as a challenge! And I love a good baking challenge! The challenge, was to bake something that would convert her into loving sweets, or at least my sweets and to make something that was dairy free and tasty. I decided I would and start with a dairy free cookie. Cookies, are a great item to start experimenting with when you’re either learning to bake or trying to create new things. You can make small batches, so less cost if you mess up, and can also make one base recipe into so many variations. Most cookies can also be stored for long periods of time and most cookie doughs can be frozen, so you can have them waiting in the freezer and ready to bake at a moments notice when surprise company shows up. So, I decided it was time to buckle down and start googling some good recipes to tackle. After an hour of searching the web I couldn’t find any that ticked my fancy. I decided to ventured into my kitchen and start whipping together a bunch of ingredients. After some trial and error I gave it one final attempt. A little of this and a little of that, some cocoa powder, walnuts, chocolate chips and some egg whites as a binder. And then voila’, I was able to create an incredibly delicious Double Chocolate Walnut cookie that was not only Dairy Free but also gluten free! The following day was the moment of truth. I packed up a box of my new creations and headed over to her place. I stood there anxious and watched while she opened the box, reach in and brought one of the cookies up to her mouth. It was almost like everything was in slow motion while I waited for her opinion. She looked at me and said that it was the best dairy free dessert she has ever had! I totally thought she was lying and just trying to be nice because she was one of my best friends. But she said, ‘Krystle, I am being serious. This is one of the best cookies that I have ever had. Its soft and chewy on the inside and has this great crunch on the outside. I can finally have something that’s delicious and dairy free, you may have converted me into a sweets person, haha! !’ I was incredibly happy! From that point on, they have become one of my most requested dairy and gluten free cookies. The moment I bake them and have them ready to go they are all bought up within the day. I love being able to create treats that people with food sensitivities can enjoy. and I love the challenge of creating desserts from scratch. It makes my heart explode with happiness when I see someone finally get to enjoy something that is catered to their dietary needs and actually tastes great too. 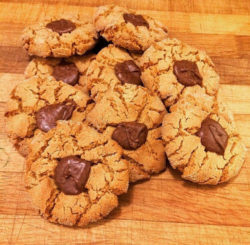 Here is an incredibly easy Gluten Free and Dairy Free Peanut Butter Chocolate Cookie recipe. This is one of my favorites and is a huge seller. It has actually converted a few of the die hard butter based cookie lovers over to the Dairy Free cookie side! *Set oven to *350 degrees. Mix all ingredients using a hand mixer until well blended. Pour some extra sugar into a small bowl. Using a large spoon, measure out heaping amounts of dough and roll into a ball and then roll dough in extra sugar. Place sugared dough balls onto a parchment lined baking pan and press them down slightly using your fingers. Cook for approximately 7-10mins, or until your cookies have a nice golden brown outer edge to them. You want the center to stay soft so they are still slightly chewy, so its better to under bake them rather than over bake, unless you like crispy cookies, then bake on! Pull out of the oven and quickly before they cool – using a tea spoon, place a nice amount of your melted chocolate into the center! These cookies are sooo good!! !